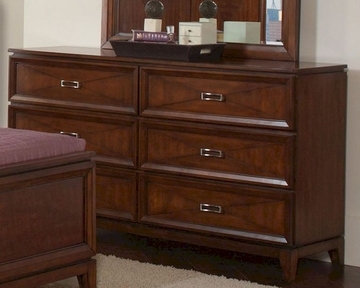 Whether used as a vanity, or merely storage piece with a nice surface space, you can be sure that this dresser is sure to radiate regal charm. The clean, crisp lines and edges makes it a perfect choice for a modern bedroom. The oak finish and cherry veneer beautifully add to any bedroom. 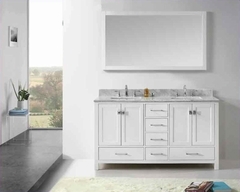 Each drawer front features a x design and rectangular metal handle enhancing the sleek style. With six spacious drawers, what a wonderful way to keep clothes and linens organized and tidy.